The American shorthair is a made-in-America breed that has been in this country for hundreds of years. A popular breed, the American shorthair - or ASH - looks comfortably familiar to the average cat lover with his sturdy body style and good looks. Of all the purebreds, the ASH looks the most like the random-bred domestics that can be found on almost any American street. However, the ASH is a pedigree with as long a history of selective breeding as any of the cat fancy’s exclusive purebreds. Shorthaired domestic cats arrived in America with European settlers because it was a common practice to keep cats aboard ships to deal with unwelcome rodent stowaways. Some of these felines jumped ship and became working cats in the barns and fields of the early settlers. Natural selection and years of surviving harsh New England winters has turned them into strong, hardy cats with adaptable temperaments. When cat shows first became popular in the late 1800s and early 1900s, these cats were prized for their vitality and natural beauty. With the import of foreign breeds like the Persian and Angora, however, the ASH lost his popularity and became known as a common house cat rather than as a purebred - poor wages for all their years of faithful service. Also, as other breeds were imported and readily bred with our hometown hero, the original, healthy bloodlines were in danger of disappearing. In the early 1900s, a group of breeders began a selective breeding program to preserve the ASH’s natural beauty and hardiness. At that time, the breed was simply called “shorthair.” It was saved from extinction, but approval by cat fanciers was long in coming. As late as 1960, American shorthairs were still treated like the cat fancy’s scruffy strays. Later, the breed was renamed domestic shorthair, and in 1965 breeders voted to change the name to the American shorthair. That year, the Cat Fancier’s Association named a silver tabby male Best Cat, and the breed finally began to receive some of the hard-earned respect they were due. 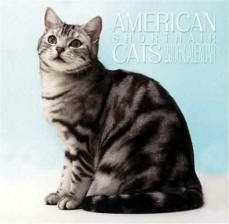 Today American shorthairs earn their share of admiration and awards. They are the sixth most popular shorthair, according to CFA registration totals. In the almost four centuries that cats have inhabited this continent, the environment – and, more recently, human-controlled breeding – have shaped them into their present form. As befits a breed that developed on the farms of early America, the American shorthair is a powerful, solidly built, muscular cat with well-developed shoulders, chest, hindquarters and jaws. A true breed of working cat, the ASH exudes power, endurance and agility and is at home both in the barn and curled up in the fanciest cat condo. The breed comes in a plethora of colors and patterns. Almost any color or pattern is allowed except those indicating hybridization, such as the Siamese pointed pattern and colors and Abyssinian agouti ticking. The most striking and best known color and pattern combination is the silver tabby, particularly memorable because of his distinct black markings set off on a vivid silver background. More than one-third of all American shorthairs possess this color and pattern. Next in popularity is the brown tabby, with black tabby markings on a rich brown background. The expression “happy medium” comes to mind. Easygoing, laid-back cats, American shorthairs are perfect for those who want a feline companion that doesn’t need constant attention but is nevertheless affectionate and devoted. They enjoy being by your side but not in your face. ASHs are also known for their quiet voices and adaptable personalities; they are sociable, easily trained, and they get along well with other animals and children. Like their pilgrim ancestors who left Europe to find independence, American shorthairs hold their freedom dear. Not your average lap cats, ASHs generally don’t like to be held and cuddled, preferring to be with you, not on you. But given room to be themselves, they are loyal, loving companions for life. Grooming is as easy as living with one of these good-natured cats. Close-lying with a lustrous look and feel, the fur is short, even and dense enough to protect against the elements. Usually, the fur needs only a weekly combing with a good steel comb. During the twice-yearly shedding seasons - fall and spring - additional combing is helpful in keeping cat hair off everything you own.